When someone gives you an amazing gift like I got exactly 20 years ago this Christmas, that amazing feeling of gratitude might not come until years later. But looking back, you realize that all those helping hands are what gave you the chance to fight another day. Let me tell you about a Christmas gift that changed my life. When I was 17 years old; I had just finished high school and was basically unemployed. I was a passionate kid who had all the answers, but was feeling a little lost about what to do next. I was raised by a single mother who had me when she was only 17, and times weren't often easy for her. That year, as she had done in the past, she reached out to a local non-profit that was putting together Christmas hampers for families in need and signed us up to receive one. In that hamper that year was the gift that changed my life, and one that I am not sure I will ever be able to repay. I was embarrassed to receive it, I never really said thank you, and I don't think I can ever truly pay that one forward. We all like to say the holidays are a time for giving, but in order to give there has to be a recipient. And when it comes to charitable causes, who do so much this time of year, we don't often hear from the recipients. I know why. It's hard to be in need, it's embarrassing, and it is incredibly humbling. I don't know how it felt for others, but as a young, brash kid I was always embarrassed to be on the receiving end of anything. What would the kids at school think if they knew their student council leader got food from the food bank? What would the girl I had a crush on think if she knew I lived in social housing? What would my friends in politics (where I eventually spent over a decade of my career) think if they knew that while we were fundraising and campaigning for change, I was also on the receiving end? So I often hid my past. I was ashamed of it, and I never properly thanked the people and the organizations that created an environment where I could break out of that situation. When you're at your lower points in life and everybody around you is celebrating the holidays, it's hard to share the glee. The dark, depressing clouds and rain of Vancouver sure don't help. And when someone gives you an amazing gift like I got exactly 20 years ago this Christmas, that amazing feeling of gratitude might not come until years later. But looking back, you realize that all those helping hands are what gave you the chance to fight another day. Share Family and Community Services in the Tri-Cities (Coquitlam, Port Moody, and Port Coquitlam) had long run a program where they pair up families in need with people and organizations who want to help someone over the holidays. Many non-profit societies in your community undoubtedly run something similar. They ask the children of those families to submit a Christmas wish list, so the family who is donating gifts knows what to buy. In my case, I was almost a man, and was a little too proud to ask for any more help. Almost jokingly, I just listed "a job" on my Christmas list. And, by some stroke of luck, goodwill, and the hard work of a family that really cared, that's exactly what I got. A Port Coquitlam family found a way to get me my first real full-time job. It was at a factory, cutting gaskets, often out of asbestos; they even arranged a carpool to get me to work and back. It was tough work, but I was so proud to do it. I was able earn a paycheque and not have to ask anyone for anything ever again. It led to me getting my first place on my own, and eventually to other work. Being able to support myself (and eventually my brother for a period of time) meant that I was able to volunteer more, to do things I enjoyed, to pay taxes, and to eventually carve out a great career. I don't think I ever thanked that family. I can only imagine how many people are giving this year and not getting those thanks, but don't think for a second it doesn't make a difference. I was fortunate that my career led me to work for and advise some of Canada's most powerful political leaders. And while I was there, the experiences, assistance, and care I received from our social safety net, from our education system, from so many non-profits, and from that family who opened a door to me, always informed that advice. Today, I head up the organization that represents all of the churches, charities, and non-profit societies in B.C. that house families in need -- including Share. Nearly 60,000 families are housed in social housing in B.C. and are able to receive gifts, such as hampers. They're also able to work or go to school because they have a home to go back to, and are able to stay out of hospitals and away from crime because they have that essential stability of an address. I do what I do and love what I do because I know how much of an impact that home and that community support can have for a family. I'm also tremendously thankful that people cared enough about me to reach out and make my Christmas, and my subsequent life, so enriching. More so than the job itself, the effort they went through to arrange so much for somebody they didn't even know was supremely impactful. Sometimes the best gifts are the ones that give us the chance to prove ourselves, or help ourselves. In my world today, I see how housing is that lever for so many people. But I also know it wouldn't be possible without people who are tremendous givers: unthanked, helpful, charitable, hard-working, thoughtful deliverers of joy. To them: thank you! Merry Christmas, and keep doing what you're doing. 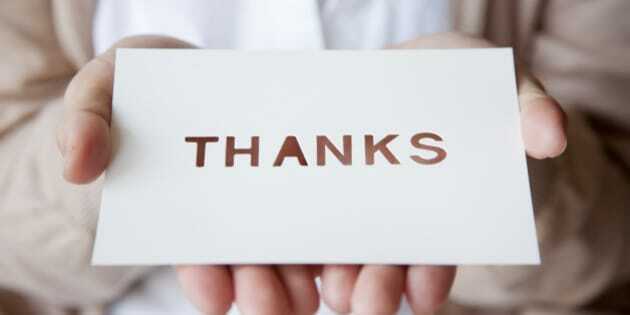 It may be tough for recipients to give you the thanks you deserve as they wrestle with their own challenges, but know that a little help now can really go a long way.